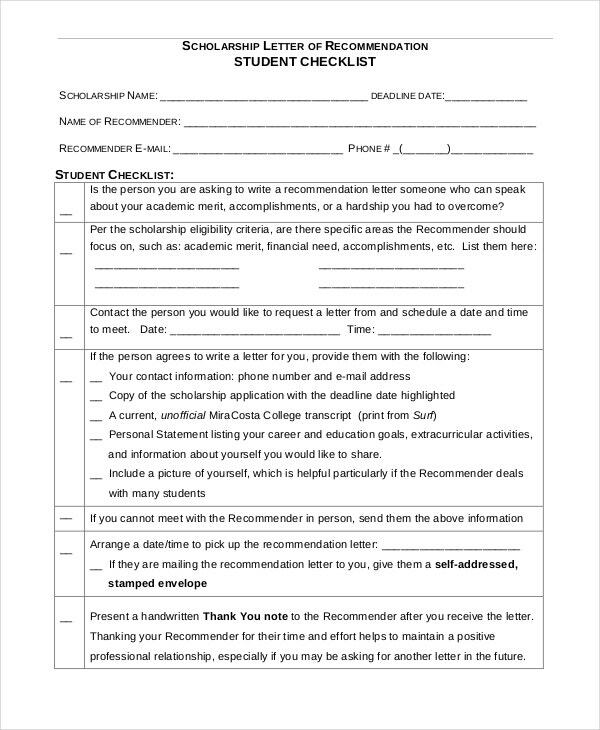 When somebody is applying for scholarship, he or she is often asked to come up with a scholarship recommendation letter. 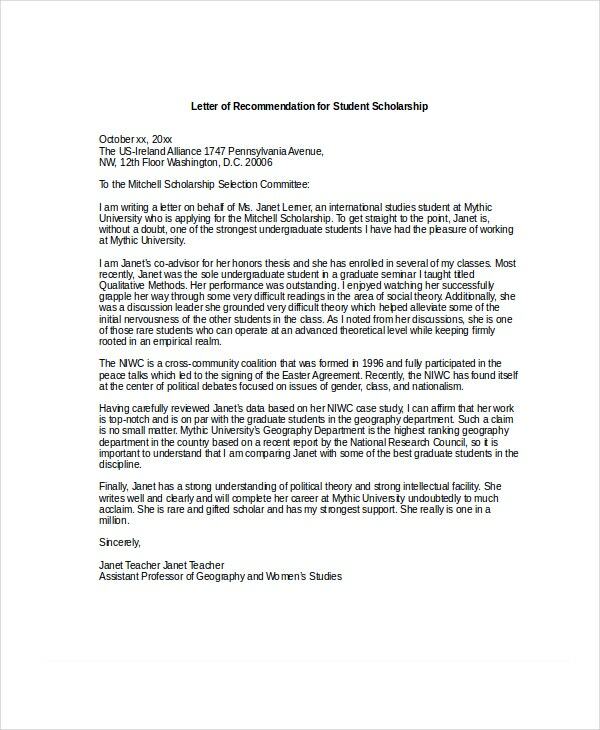 Even if the letter is not asked, such a recommendation letter would be great to render an additional boost to the scholarship application. These letters inform the scholarship committee about the great abilities and achievements of the candidate and show how much the candidate is fit for the grant. A validation from a 3rd party is very helpful in determining the scholarship.You may also see recommendation letter for college template. 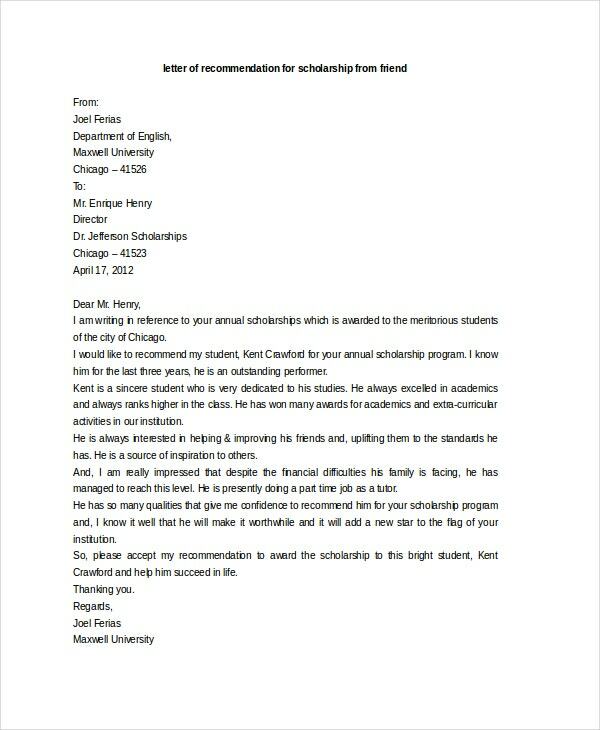 You have a standard Scholarship Recommendation Letter for a student here which states the relationship of the writer with student- and then focuses on the student’s potential, achievements, and eligibility for the scholarship. You have an extensive college and scholarship recommendation letter here which starts with the basic details of the student and also gathers information about his semester, community involvement, participation in sports, etc. 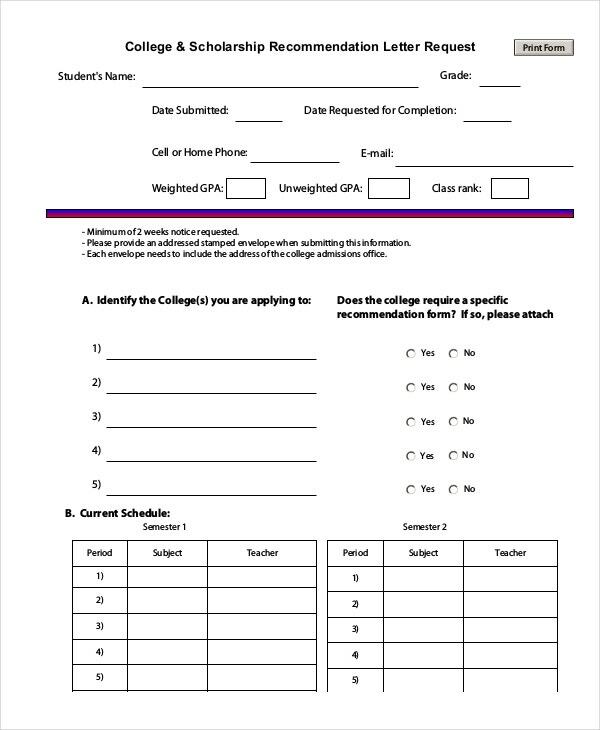 This template here comes with instructions to follow while requesting someone for your scholarship recommendation letter and it also provides a checklist to ensure you don’t miss out on any step. 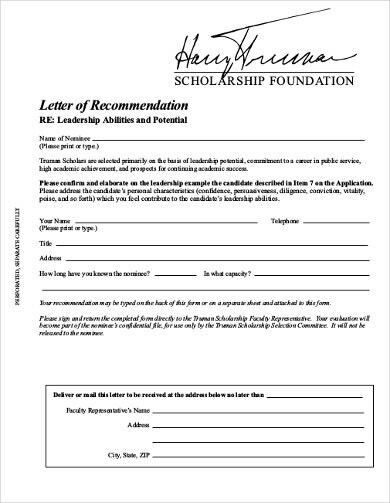 > What is included in a Scholarship Recommendation Letter? 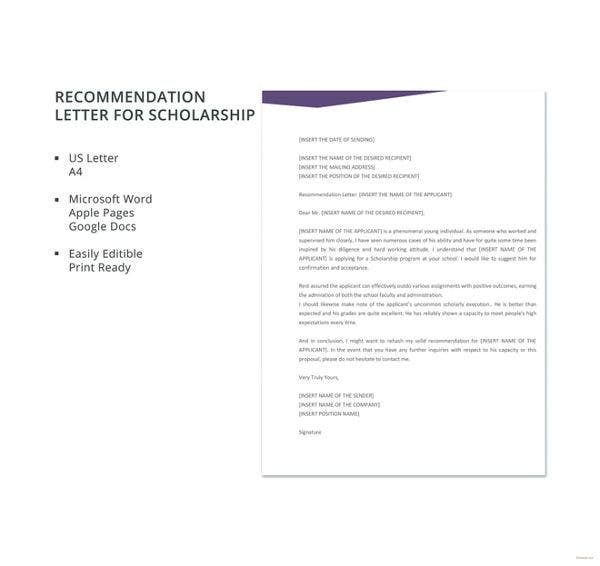 When it comes to writing a scholarship recommendation letter, it would start with the message regarding the request of scholarship application for the student to the scholarship committee. Then, you will state your relation with the student or how did you get to know about him or her. 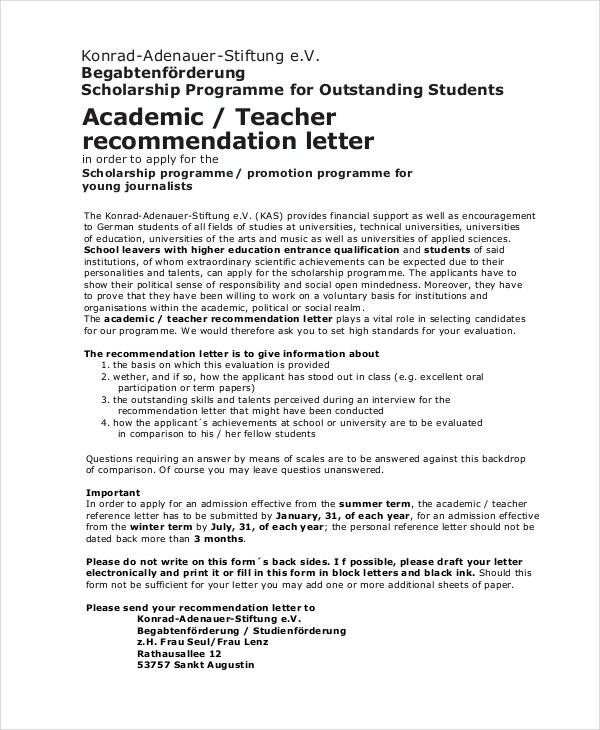 Another major part of the Letter of Recommendation for Student is a brief description of his/her abilities and potential as you got to know about. Then, the letter will also share the achievements or accomplishments of the student. You will conclude the letter describing in what ways the student would be eligible for the scholarship and that you have full faith in him/her as a prospective candidate. 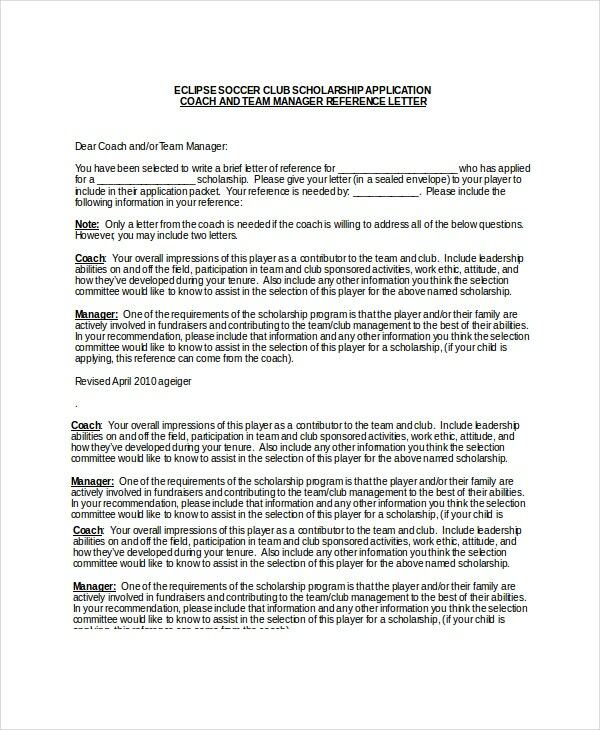 This template urges a soccer club coach and manager to write a reference letter for a player who has applied for a scholarship. The template provides tips and instructions on writing the letter. This template here is meant to gather information of a teacher who would be writing a scholarship recommendation letter for a student. The form also notes the teacher’s viewpoint about the student. > What are the best tips to write a Scholarship Recommendation Letter? 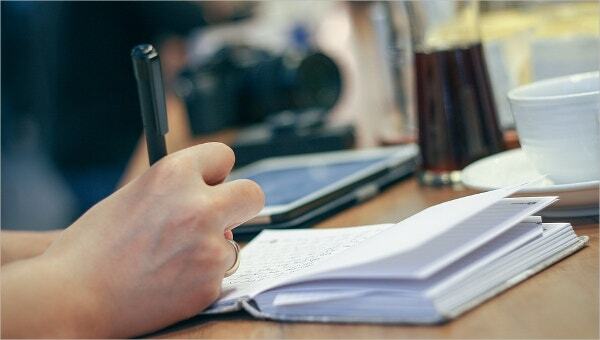 If you have been asked to write a scholarship recommendation letter, you must first ensure that you have sufficient and authentic information about the candidate. It’s because you will need to describe his abilities and achievements in the letter. Then, you should also study the scholarship program that is being applied to as you would have to align the student’s qualification and observations or anecdotes in tune with the specific scholarship program. Focus on the areas where the student has shown outstanding strength and talent. Mention how confident you are about the student as your heartfelt endorsement would play a decisive role in getting the scholarship. You may also check College Recommendation Letters. 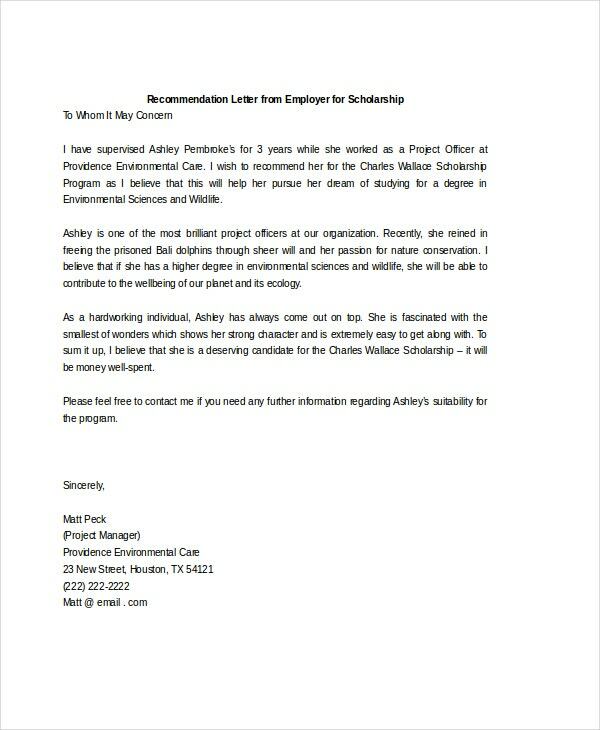 Writing a scholarship recommendation letter is a serious affair as it can influence a person’s higher education or career. If you need help in drafting a solid recommendation letter, the templates mentioned above are just the thing you need. They have come up with pre-structured scholarship recommendation letters which can be modified easily with your specific details.